Every week we get Down & Dirty, in which we break down our favorite unique seasonal fruits, vegetables, and more. Today: It's more delicate in texture and flavor than the standard green cabbage you might be used to, but this cabbage is no featherweight. 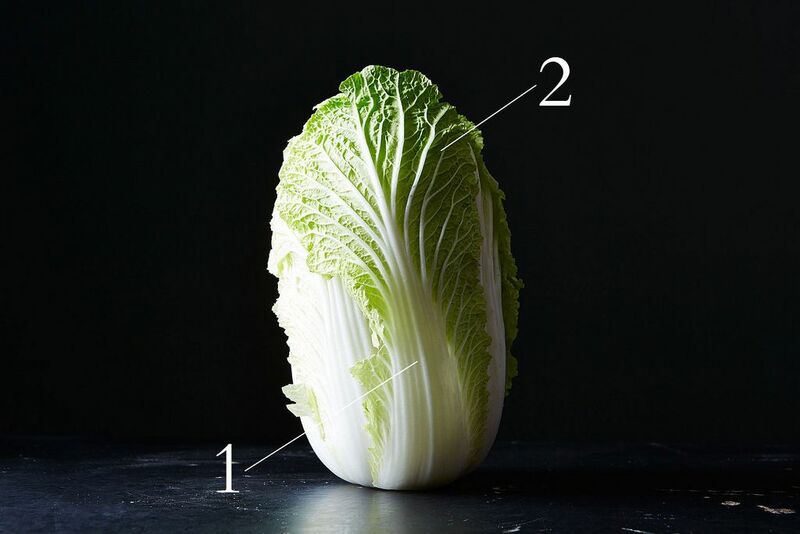 As its name suggests, napa cabbage is indeed a cabbage (more specifically, it’s a type of Chinese cabbage and it's sometimes simply called Chinese cabbage, but that gets to be confusing rather quickly, so it's best to stick with napa), and that puts it in the enormous brassica family. 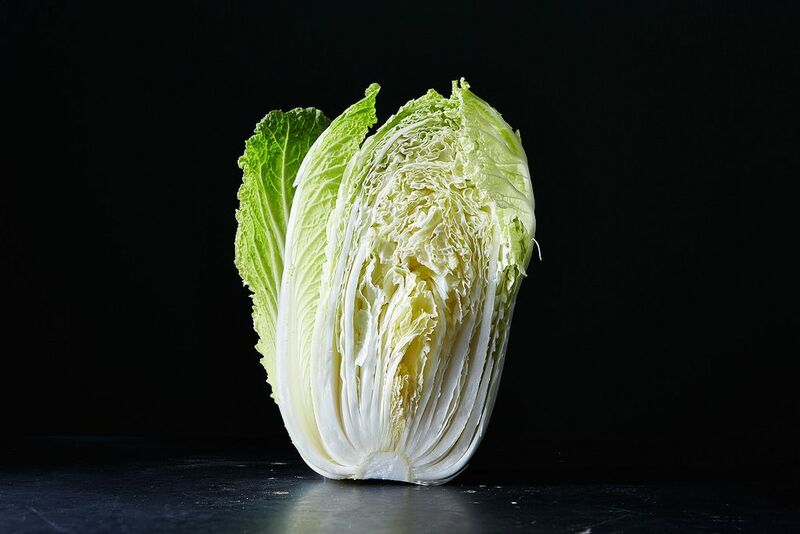 One quick glance will tell you that a napa cabbage looks different from a standard green cabbage -- its thick white ribs (1, as shown below) and crinkly yellow or pale green leaf blades (2, below) are hard to miss. But it's not just their looks that are different: As Russ Parsons notes in How to Pick a Peach: "Asian cabbages (Brassica rapa) actually come from a different species than European cabbages (Brassica oleracea). They are more closely related to bok choy, broccoli rabe and, most oddly, turnips." If it seems surprising that they belong to different species, consider Joy Larcom's explanation of the origins of napa cabbage: Chinese cabbages did originate in China, but "no wild Chinese cabbage has ever been found. It was probably a cross that occurred naturally in cultivation between the southern pak choi and the northern turnip." And because we know you're wondering: Parsons claims that the name napa comes from the Japanese word nappa (a word which refers more generally to leafy greens than to this specific type of cabbage -- napa cabbage would be hakusai in Japanese). Many agree with that theory, but others will argue that the moniker is in fact tied to wine country, where the cabbage was first commercially grown in the U.S. If you go with the latter explanation, you’ll want to remember your capitalization rules: Write it as Napa cabbage, and be prepared to explain yourself. You might be able to find napa cabbage at your regular grocery store, but if not, you shouldn’t have any trouble sourcing it at an Asian market -- where Elizabeth Schneider not-so-subtly suggests you should procure it regardless: "Generally speaking, the difference between cabbage in the two markets is the difference between a clean, crisp, juicy, vegetable and flat, foolish Styrofoam. Although the cabbage may not look over the hill in Western markets, it rarely has the sheen, solidity, and succulence I’ve seen in the Asian." Wherever you find it, pick a heavy specimen with bright white ribs and crisp leaves -- ones that don't look limp and tired. Sometimes you’ll hear that napa cabbage should be stored in a plastic bag in the refrigerator. I rarely find zip-top plastic bags in elongated bowling ball size, so unless you’re comfortable tucking your cabbage into a garbage bag, try wrapping it in plastic wrap instead. Like Western cabbages, napa cabbages can be stored for a long time, but they’re at their best within the first few days, especially if you'll be using it raw in a salad or slaw. More: Here are all of our best storage tips for keeping your refrigerator well-organized. Make kimchi. Once you have, here are five ways to use it that you haven't thought of yet. 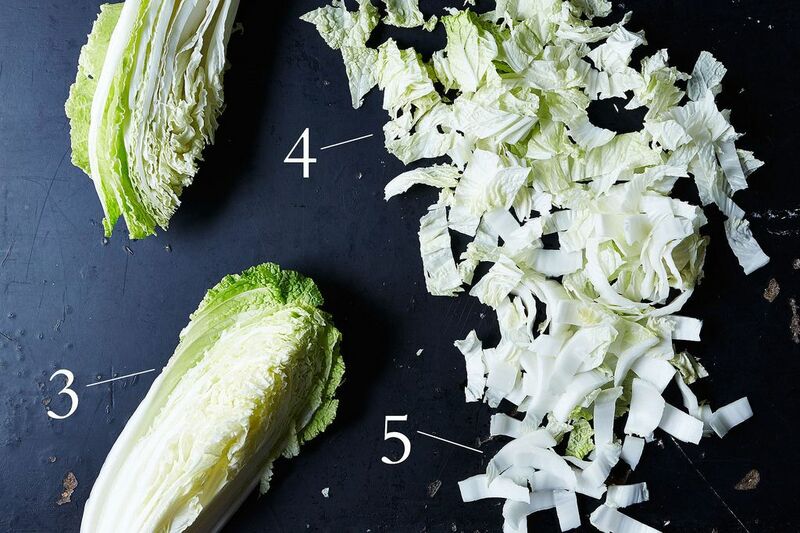 Update the classic iceberg salad by using a napa cabbage wedge (3). Or skip the wedge and chop it up (4) for a salad -- try one with Cara Cara oranges and Kalamata olives or one with hot bacon dressing. Let napa cabbage add some crunch to noodle salads, too. Shredded, it turns into a fluffy pile and makes the perfect base for a slaw. Try a tahini sumac dressing or one with ginger, almonds, and sesame seeds. Or stuff those shreds into fresh spring rolls. Use napa cabbage in a filling for dumplings (with beef and pork or pork and shrimp) or steamed buns. Add napa cabbage to a stir-fry. Use it in a hot pot or soup (beef, chicken, pork, tofu, or vegetable). The rib pieces (5) will soak up the flavor without turning to mush. If you want additional crunch, just add more napa cabbage near the end of cooking. Tell us: How do you like to use napa cabbage? How do you know when to throw it away? I use the outer leaves of napa as shells for stir fry - kind of in a lettuce wrap adaptation. Also - shred the inner leaves and add my patented garlic infused olive juice... So delicious! My favorite is chopped for salad with avocado, dill, a little garlic and add a little olive oil, season salt and lemon juice to toss. It's the most refreshing salad on a hot summer day. You can do Korean BBQ and use Nappa cabbage instead of lettuce. I grew these in my high-altitude garden (9000') in Colorado last summer and they thrived. My favorite thing to do was brush them with olive oil and lemon juice, sprinkle with salt and pepper, and grill them whole. Delish. Lindsay-Jeaaan. You are a fount of information. Chopped sautéed in butter with salt & black pepper.